I wanted so very much for the North American/world premiere opening night of ‘Rose’ to soar through the rafters of Baillie Theatre. Well, it didn’t completely reach that height for me except for the ‘eleven o’clock’ showstopping number in the second act by a completely believable and touching Hailey Gillis as the title character. Based on Gertrude Stein’s only children’s book ‘The World is Round’ Rose is the story of a curious and tenacious nine-year-old girl who begins to think more about the composition of the ‘what’, ‘where’, ‘when’ and ‘why’ surrounding her that will begin to tell our protagonist ‘who’ she is while wanting to fit in with her community. Rose can’t even say her name, but she knows that she exists. (quite the existentialist thought for a nine-year-old child). In the process of trying to understand who Rose is, we meet other residents of her small town, Somewhere (which leads into another philosophical understanding), who try to help Rose understand who she is. Some of these citizens are oddballs, some different, some ‘normal’ (if such a term truly exists in this existentialist philosophical world). The story is told on an almost bare stage with tables that are used nicely for the protagonist’s climb on the mountain to discover who she is and what her place is in the world. Keyboard player James Smith was located stage right and Drums player Adam Warner was located stage left. I’ll be honest and say that I haven’t read Miss Stein’s The World is Round. Perhaps if I do read it sometime soon, I might be able to see a further connection to some of the more heady and philosophical ideas in the musical. The challenge for me regarding an appreciation of ‘Rose’ was trying to decide whether I need to watch the production either from a child like, whimsical perspective that exists within each of us (as we’re told in Mary Poppins Returns) OR from an adult, responsible perspective where we want to enlighten our lives with headier philosophical understanding. The opening address of Frank the Logger at the top of the show reminded me of Thornton Wilder’s Our Town. Then a few minutes later, I saw a connection to L. Frank Baum’s The Wizard of Oz. Near the end of Act One, the staging of the choreographed ensemble in song reminded me of the end of Act One of Les Miserables. This table tennis vision left me feeling a tad empty at the intermission as I felt disconnected. It’s as if Director Gregory Prest might be trying to accommodate too much. Mind you, ‘Rose’ is not a terrible production as there are some standout moments for me. Hailey Gillis’ performance is rather tender as the precocious and inquisitive child-like Rose. Her journey and quest to the top of the mountain to discover who she is reflects in adults those moments where we must sometimes travel on our own in order to understand and deal with challenging trials in our lives. Her eleven o’clock showstopping number in Act Two finally clicked for me in understand what I think Mr. Prest wanted us to see. (I don’t want to spoil that moment any further as Ms. Gillis’s moment in song touched at my heart strings). Very nice vocal work at this moment. Jonathan Ellul’s performance as Rose’s dog, Love, grew on me after awhile and I looked forward to those moments when he did appear on stage. Love is only understood by members of the audience and not by the characters in the story (again, further philosophical analysis that I wondered if young children would truly get in watching the production. Peter Fernandes as Rose’s friend, Willie, is completely charming and believable in his performance (and a nice singing voice, I might add). The opening address of Frank Cox-O’Connell as Frank the Logger to the audience was a nice touch as he and his band magically drew us away from an overcast, dreary winter night to ‘Somewhere’ else. It’s always exciting for a new musical to premier as we get to hear new musical adaptations and arrangements. I’ve heard composer and Music Director Mike Ross’s extraordinary work in other Soulpepper productions (Spoon River brought tears to my eyes periodically). There are some ear pleasing moments in solo and choral work that are effective; however, from my seat near the back of the house, I had difficulty at times in hearing the lyrics as the sound balance between the banjo, guitar and violin along with other members of the band stage right and left drowned out the words. As performances continue, I do hope that sound balance can be achieved so future audiences can hear the lyrics. 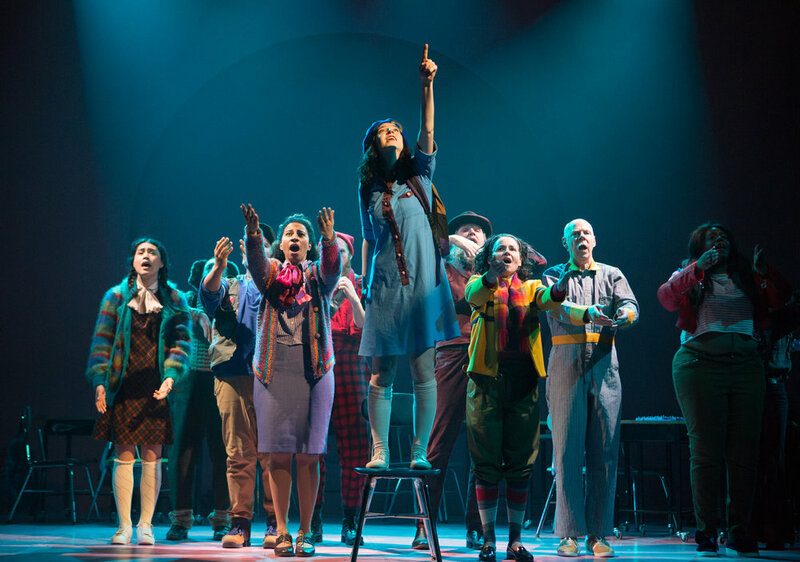 Final Comments: Co-creator Sarah Wilson wrote in her Program Notes that the creation of a new musical is both brave and absolutely bonkers as Rose climbs the mountain to find the answers she seeks. I applaud Soulpepper for the very fact the company took this risk and chance to tell us a fresh story and allowed us to hear new music. ‘Rose’ continues in Toronto’s Historic Distillery District until February 24 at the Young Centre for the Performing Arts, 50 Tank House Lane. Visit www.soulpepper.ca for further information or to purchase tickets online. You may also call the Box Office at (416) 866-8666. Photo of Hailey Gillis as Rose and the ensemble by Cylla von Tiedemann.